We want everyone to do the best that they can, care for each other, work together and show us that you know how to live the school values and follow the school golden rules. When we catch you doing something great or trying hard, you’ll be given a star and when you’ve collected 5 in Year R, 10 (if you are in Year 1) or 20 (if you are in Year 2), you will be presented with a gold card in our Friday Celebration Assembly. 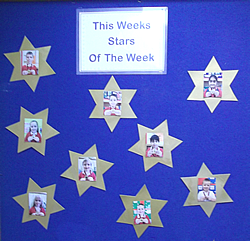 Each week two children from every class are awarded the star of the week certificates and medals for always trying their best, concentrating hard or doing some super work. Our Celebration Assembly is just that – it’s a way of the whole school to know you’ve done brilliantly and to say “Well done”. It’s the highlight of Miss Aldred’s week!